Starting off November in this centenary year of the outbreak of World War One, inevitably leads to thoughts of Remembrance. Just how do we honour the dead, particularly those fallen in war? Hugely successful has been the idea of artist Paul Cummins to fill the moat of the Tower of London with ceramic poppies. 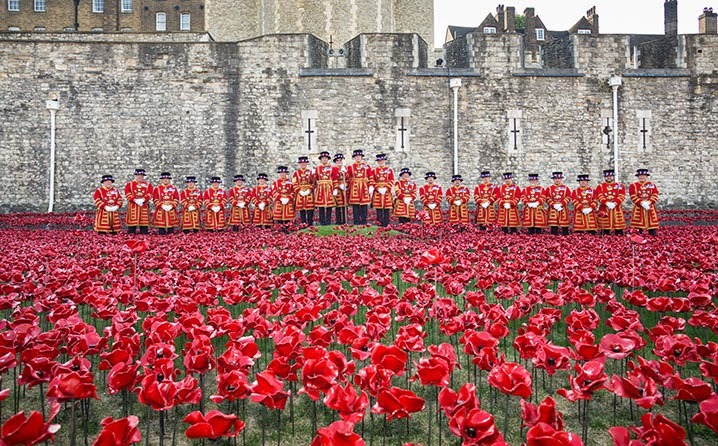 This has proved a very successful installation, with crowds flocking to see the growing "Blood Swept Lands and Seas of Red" artwork, while volunteers plant the poppies. The last of the 888,246 flowers, each representing "a military fatality during WW1"will be set in the moat on November 11th, Remembrance Day. 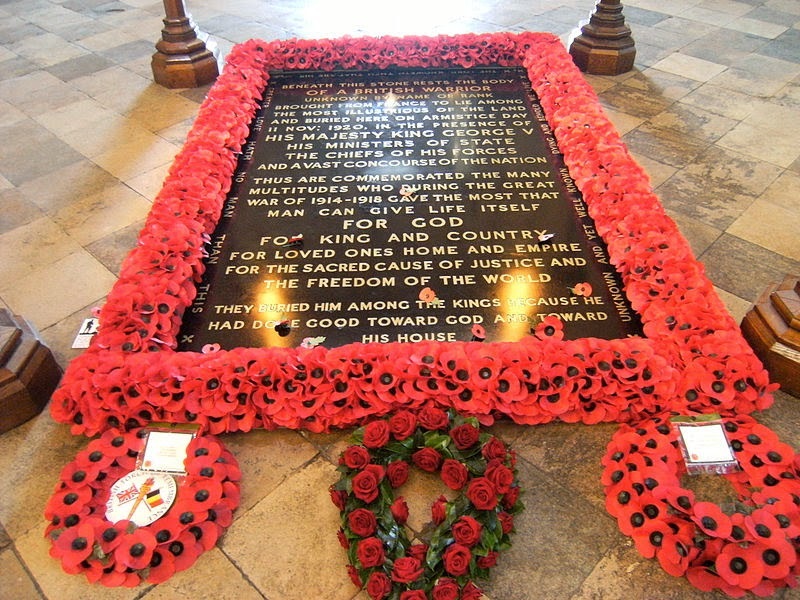 I can't be there then, as it's midweek, but hope to go on Remembrance Sunday, November 9th and attend a service in the Tower Chapel, St Peter ad Vincula, where the bones of Anne Boleyn, Jane Seymour and so many other names from English history lie under the stones. I always buy and wear a red poppy, alongside one of the Peace Union's white poppies. Leslie Wilson wrote about the poppy's symbolism here on 23rd October. Jonathan Jones, the Guardian's Art critic hates the sea of them at the Tower, calling it "a deeply aestheticised, prettified and toothless war memorial." Both feel, with good reason, that we are prone to honour only the British dead and those who were combatants. We are of course free to think of whom we wish in the two minutes' silence: men and women, Allies and Germans, military and civilian deaths, the "Great" war or any other conflict. We need to honour the dead; it is hard to think of any culture where this is not important. Antigone needed to bury her brothers, Achilles had to retrieve Patroclus' body from the battlefield where he had been killed and Priam in his turn had to beg Achilles for Hector's desecrated corpse. The British soldier buried here in 1920 represents all those who fell in France but whose families were unable to retrieve their mortal remains and give them their funeral rites. (All photographs of the skeleton are copyright of the University of Leicester but you can see one here). Anyway, I'm sure you all remember the excavation in the car park which revealed the remains later identified as those of Richard, under a parking spot conveniently marked "R" and the subsequent TV programmes, press conferences and so on. And then the fascinating court case about where those remains were to be interred. The Plantagenet Alliance, consisting of "collateral descendants" of the king was formed by Stephen Nicolay, the 16th great-grandson of Richard Plantagenet, 3rd Duke of York (father of Richard III). They were granted a judicial review of the burial place, wanting the king to be interred in York rather than Leicester. But in May of this year Lady Justice Hallett, sitting with Mr Justice Ouseley and Mr Justice Haddon-Cave, ruled there were no public law grounds for interfering with the plans for reburial at Leicester Cathedral. The re-interment will cost £2.5m and will take place in Leicester cathedral as planned. It will receive the King’s remains on March 22, 2015 and they will then lie there for three days. The king will then be reburied during a ceremony on March 26, likely to be conducted by the Archbishop of Canterbury. 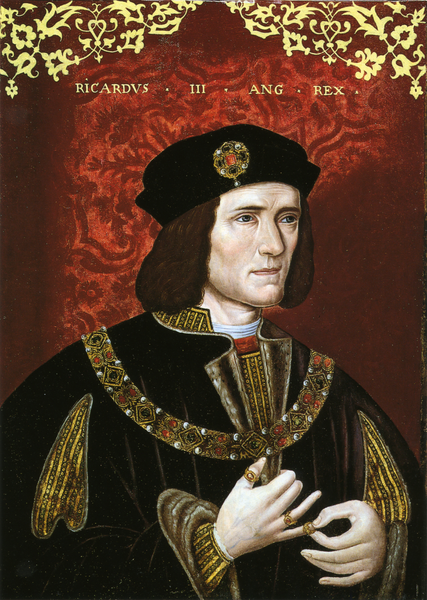 And from March 28, the area of Richard III’s tomb will be open to the public. 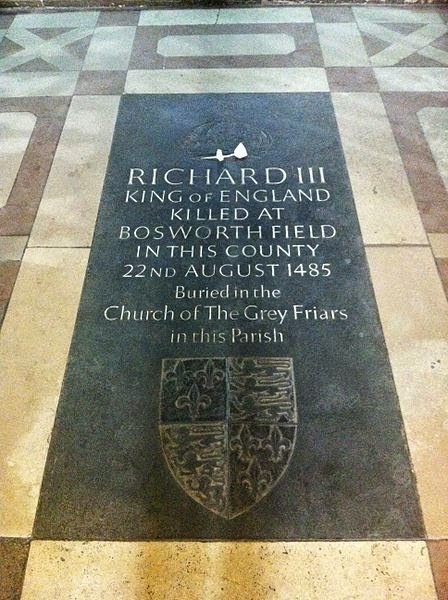 There has been controversy throughout - were these Richard's bones? Where should they be buried? Should a king with his record be honoured at all? What was that record? One thing is clear. A million pounds has already been raised towards the cost of the funeral of the last English king to die in battle. There are many people who want to see this thing done properly. Dr Alexandra Buckle of Oxford University has reconstructed the form of a medieval re-burial service. "Let us pray. Omnipotent and eternal God, creator and redeemer of souls, who through the prophecy of Ezechiel are worthy to bind together truly dry bones with sinews, to cover them with skin and flesh, and to put into them the breath of life, we suppliants pray to you for the soul of our dear [INSERT NAME] whose bones we now place in the grave." We can all "insert name" this month, whether it is that of King Richard or not. Labels: Mary Hoffman, Paul Cummins, Poppies, Remembrance Day, Richard III, Tower of London, WW! The thousands of mostly working men used as cannon-fodder should rightly be remembered - but with all the hacking of public services going on to pay for banker's greed, this government is spending 2 million on re-burying a king dead for centuries? What a farce. Susan Price, I was about to write something similar to your post and I echo your thoughts here. I am all for honouring the war dead particularly those whose families did not have the means to return their loved ones' bodies, but I find it shocking, frankly, to consider spending millions on the burial of a long-gone king, and not even a fine one. There are so many living who are in need of education, health care, special services.. would it not be a better way to honour Great Britain and what the nation purportedly stands for by spending these millions on those who are in need? I don't think the government is paying. £1m has already been raised by public subscription and it may be that it all comes that way. Whether the money could be better spent is another matter! I was glad Jonathan Jones pointed out the chauvinistic thing about the poppies - though I am always moved by the poppies blooming at the end of the last Blackadder episode. It depends upon the context. I take your point, Mary, that one can think of whom one likes during the 2-minute silence; but I have already decided to boycott it this year. I shall remember the dead of war in the silence at Quaker Meeting on Sunday, but I do feel, with some bitterness I am afraid, that for many people in this country the war is not yet over.